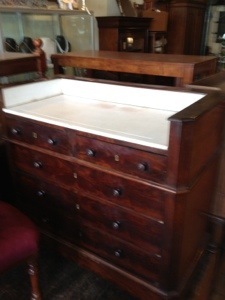 A marble topped chest of drawers from France. 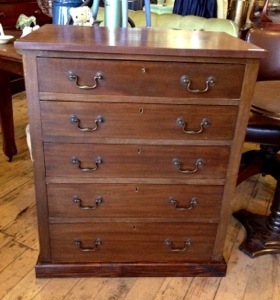 Made in the late 19th century, and featuring flame mahogany veneers this is an exceptional piece. $1190. Balloon back chairs x 3. 3/3 sold. 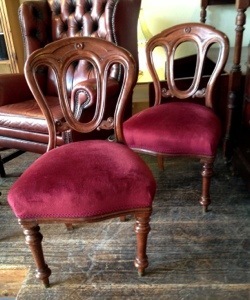 Three mid 19th century balloon backs with new red velvet upholstery. $59 each. 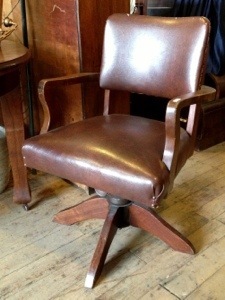 From the 1930’s this swivelling and height adjustable desk chair is pure Maltese Falcon. It just requires a clattering fan, filtered light through slatted blinds and a perspiring Sydney Greenstreet on the other side of the desk. Oh, and a desk of course. Where was I. Why even the brown vinyl is an authentic touch. $195. With a new top and skirt, there is only the main body, drawers, working locks (and rare to find keys) that are original. This authentic part is from 1920. The top and base probably less than 20 years old. This neat little chest is in good condition and should do the trick for the next century ( or so). $385. It is a little hard to date this depression inspired piece of furniture. It appears to be at least 50 years old and the cut out areas of the kerosene tins that make up the drawers have all been neatly folded. No Phillips head screws either, but we feel it is later than the actual Depression Era of the early 30’s. 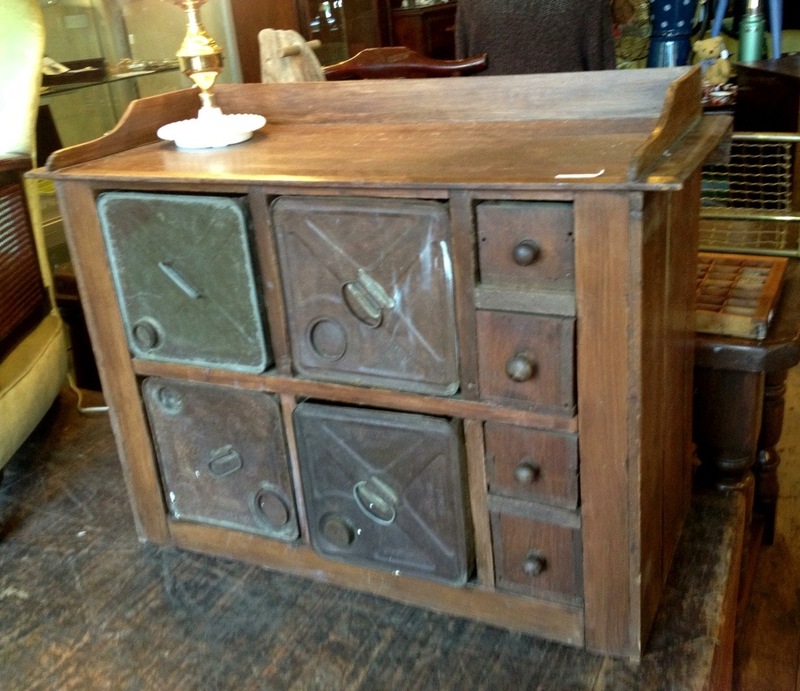 anyway an interesting piece of salvage furniture.Was $195. Now $145. 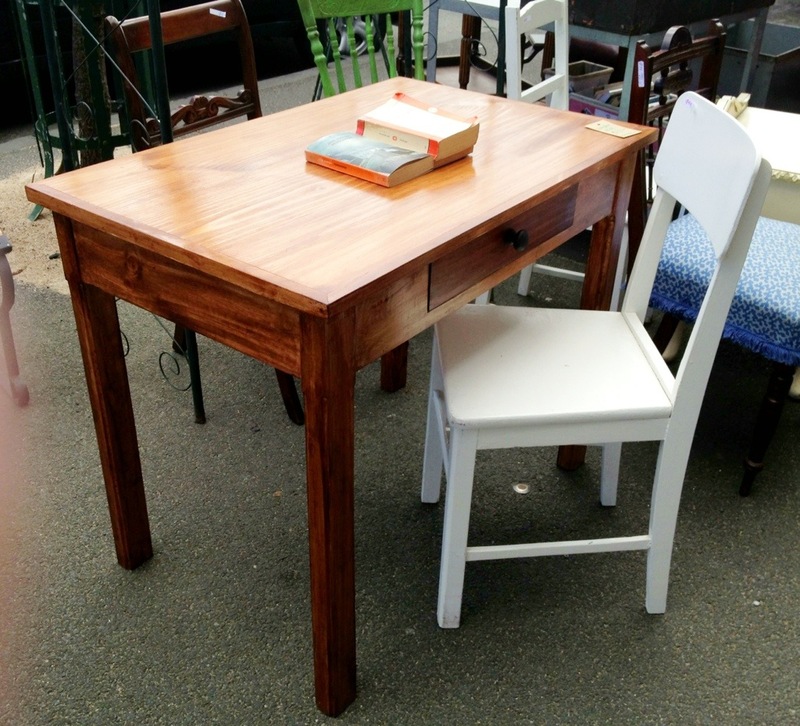 Recently made by a local cabinet maker, we have sold three of these desks in as many months. A practical size with one drawer $110. 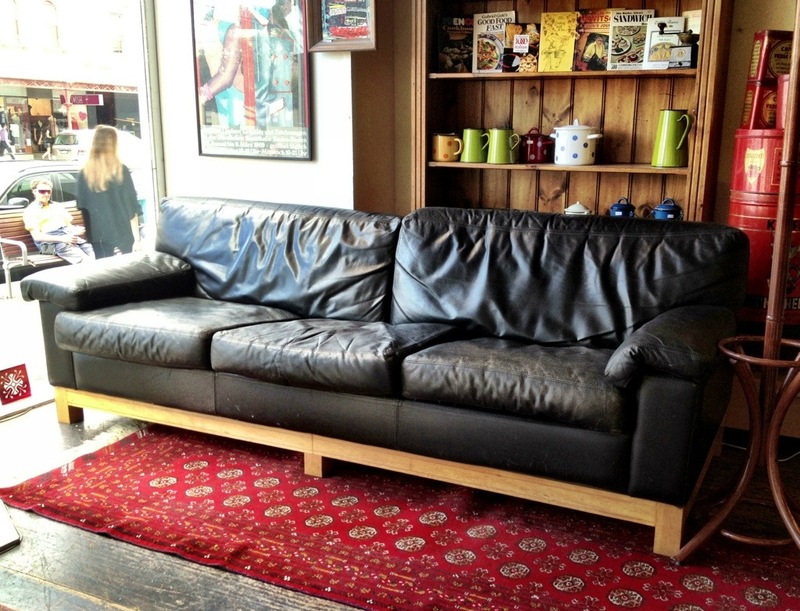 This one is black leather, 2.4 metres wide and has a some scuffing, nicks and a tear under the arm rest. However if you train for the Harlem Globetrotters, and you like to lie down on the sofa while you watch Louis Louis in the evening. Well then this could be the couch for you. $390.